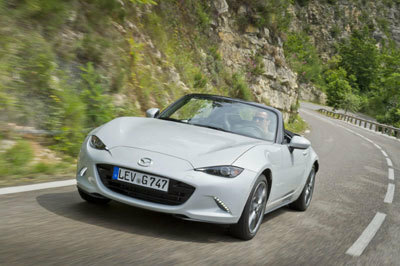 The all-new Mazda MX-5 is available from £18,495 and launches with a range of finance options to suit every customer. Available with 0% APR* representative with a minimum 50% deposit on Mazda Conditional Sale (12, 24 or 36 months) to 5.9% APR** Mazda Personal Contract Purchase up to 42-months with no minimum deposit offers customers complete flexibility. The latest-generation Mazda MX-5 is available to pre-order now at mazda.co.uk/mazda-mx-5. After making its UK debut at the 2015 Goodwood Festival of Speed, Mazda dealerships across the UK will host an exclusive customer preview event of the all-new Mazda MX-5. From the 8th July the all-new MX-5 will take part in nationwide tour, where customers will have the chance to see the hotly-anticipated convertible in the metal, plus experience it in exciting and dynamic new ways using high-tech Oculus Rift virtual reality headsets. For further information on the preview events, interested parties should log on to: mazda.co.uk/preview-events. The all-new Mazda MX-5 is a roadster in the truest sense of the word; rear-wheel drive, 50:50 weight distribution, superior power-to-weight ratio and a low centre of gravity. Conceived under the concept of ‘innovate in order to preserve’, the generously-equipped all-new Mazda MX-5 is offered with a choice of two SKYACTIV-G petrol engines and boasts new levels of safety technology. The innovative approach has also allowed the historic roadster to maintain the agility, fun and driver engagement that has always defined the iconic car, while meeting ever-increasing safety and efficiency requirements, alongside improved refinement. Maintaining the driver-focused ethos that has made the Mazda MX-5 the best-selling two-seater sports car of all time, the all-new Mazda MX-5 will reaffirm its dominance of the affordable sports car sector with a choice of nine models with five trim levels. The lightest Mazda MX-5 since the iconic original, the all-new Mazda MX-5 is shorter, lower and wider than the outgoing car. This, combined with Mazda’s striking design and award-winning SKYACTIV technology, ensures that the car’s focus on driving pleasure remains unmistakable, while delivering new levels of performance and economy. “We are already seeing a high number of pre-order customers and we’re delighted to offer customers some excellent finance offers across the all-new Mazda MX-5 range. With no minimum deposit on PCP, our customers are able to choose the deposit and monthly payment that best suits their budget, meaning a sports car has never been so attractive, or affordable, especially with 0% APR* available on conditional sale. The benefits of PCP also makes things so simple when the contract ends. What was already a striking prospect in the all-new Mazda MX-5 has become even more so thanks to the range of finance options,” commented Peter Allibon, Sales Director, Mazda UK.